Today, we are excited to announce that the Auto Follow has been upgraded and now you get more of it. We added so many features to suit any of your needs. Let's start to see how does all the new stuff works. Now, after so many of you requested, we have improved how targeting works. To be able to explain how it does work now, you will need to understand what is a target. A target is a Hashtag, Places or People that you want to Auto Follow. It might sound a bit confusing so let's see an example. For example, you select a Hashtag. The Auto Follow will follow Instagram accounts that have used that hashtag recently. If you select another target, will follow accounts that has either of these targets. For example, #Hashtah1 and #Hashtag2. It will get accounts that has recent posts with the #Hashtag1 or the #Hashtag2. With locations or people will be the same. This feature is a need if you are managing loads of different accounts of similar niche. Now, you can import all the targets, hashtags, locations and people from one to another by only clicking a button. This feature isn't new, but I want to explain why it is there and what it does. It doesn't do anything but control the speed of the automation. It works well if you are using in conjunction with the Auto UnFollow. For example, you want to follow faster than unfollow. Or there will be times that you want to keep Auto Following but at a slower rate than. Another new feature that was highly requested by many of you. It does what you might imagine. It limits the accounts to follow by gender. If your target audience is men, now you can go, and Auto Follow just men's Instagram Accounts. No other Auto Follow automation offers this, and we think that will help many of you to fine tune it to find those people that can be interested in what you suggest. Another great new filter. Now you can leave those private profiles alone if you want. Those that set their accounts as private, they wish to be left alone, so you have the opportunity to do so. This filter will check if the Instagram account has a profile image. If activated, it will only Auto Follow those profiles with a picture. This is great to avoid spammy Instagram accounts or fake accounts. At InstaSky, we want you to gain organic followers, so we think this feature is excellent. This other parameter will ensure if activated that you don't keep following accounts that you have unfollowed by the Auto UnFollow automation. Here you can write the usernames that you want to avoid auto-following. Super simple to use, remember to separate them by a comma. A new modality that combines the Auto Follow with the Auto Like automation. With it, you will be able to like some posts from that account that you will be following. With this, you will be looking more natural and more chances to get a follow back. Just be aware not to select too many posts to like and if you do pick the randomise option. Here you can set the minimum number of posts that the accounts to follow must have. Another great filter to avoid auto follow accounts that don't bring any value to yours. This is the maximum number of days since the account to follow the last post. Another great filter to target active accounts. At InstaSky, we are using it in all our automations. 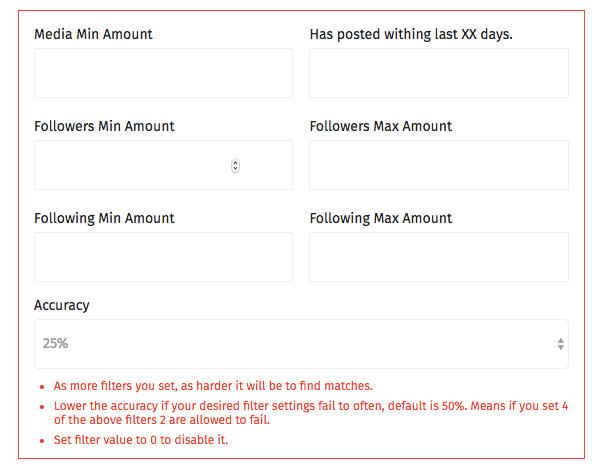 The next four filters are all related and will help you to get the kind of account you want to auto follow. For example, if you are looking for big accounts and trying to network with them, Auto Follow will help you to find them and to follow them. In the other hand if you are looking for real people that aren't influencers, then you might want to set an upper limit on follower account. We have added loads of filters to enable you to find the right Instagram accounts to follow, but as I already said before, it means that you can also go too far and set a configuration that has little accounts to follow. Accuracy will help you by making your filters a bit more flexible to find matches. I left this one for the last one because you should set the status to active once you are entirely happy to start the automation. Establishing the state to active will trigger the Auto Follow and begin following accounts. Also, once active you will see in your account that instead of saying inactive under your username, it will say active. It is important to note that once your Auto Follow is active, it is essential checking the log often. If it starts to fail because can't find more accounts to follow, you will see it there and react to it. If not, it will stop the automation, after a few fails. We hope that you love all the new features and you keep growing your accounts organically, reaching all your Instagram marketing goals. Please feel free to contact us for any feedback or more features that you would like us to implement. We want to create the best Instagram tool ever for you.